Risqué styling aside, the 2016 Prius offers interior, handling, and efficiency updates that put car lengths between the original hybrid and its competition. Toyota made a sizable wager in 1997: By building the world’s first mass production gas-electric hybrid vehicle, initially for Japan, and then worldwide three years later, the automaker bet consumers would quickly move past skepticism and on to enthusiasm for the efficiency of a hybrid. 18 years and 3.5 million global Prius sales later, Toyota may have competition from just about every major automaker, but all of them must first watch what the master does before acting. 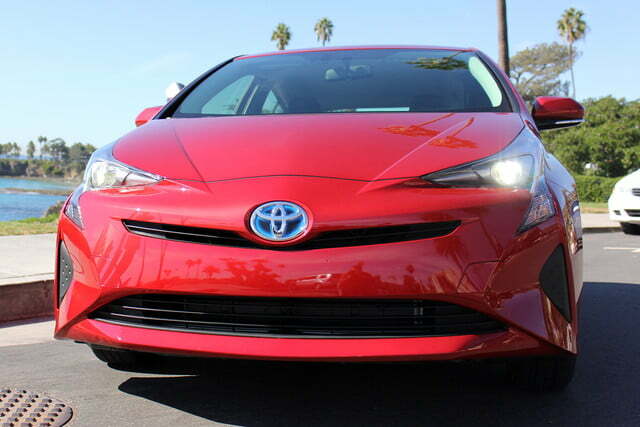 With the introduction of the fourth generation Prius, Toyota is in a far different predicament than it was all those years ago. 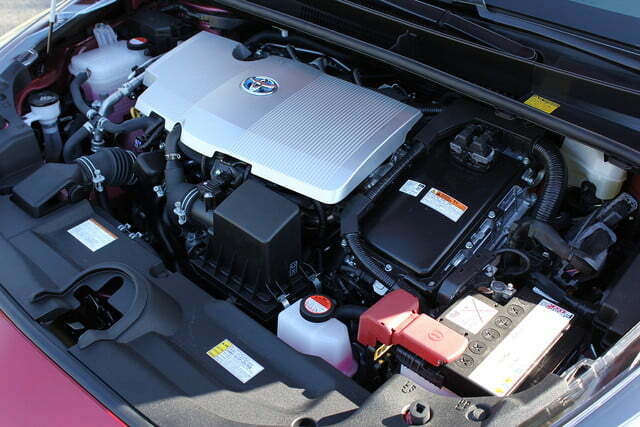 Consumers no longer fear the distant whirr of a hybrid powertrain or wonder whether the technology will fail. Instead, the new crop of early adopters are eying pure electric vehicles and scoffing at anything that still creates emissions. The Japanese automaker therefore has a two-pronged trial on its hands: convincing owners of current hybrids (previous generation Prii included) to trade-up to the all-new model, and steering those who long for greater efficiency than even the most fuel-sipping of petrol or diesel engines towards the hybrid world’s equivalent of the godfather. It’s not a question of whether Toyota’s 2016 Prius will get on the podium; it’s a question of whether it still has the goods to earn gold. When asked about the fourth generation Prius’s somewhat polarizing new face, company representatives cited aerodynamics as a major reason for the dramatic design tweaks. Toyota claims the new body’s 0.24 coefficient of drag is the lowest of any mass production vehicle on the market. While that’s certainly impressive, the current generation is only slightly off that pace, with a coefficient of drag of 0.25. Surely that couldn’t be the only reason. 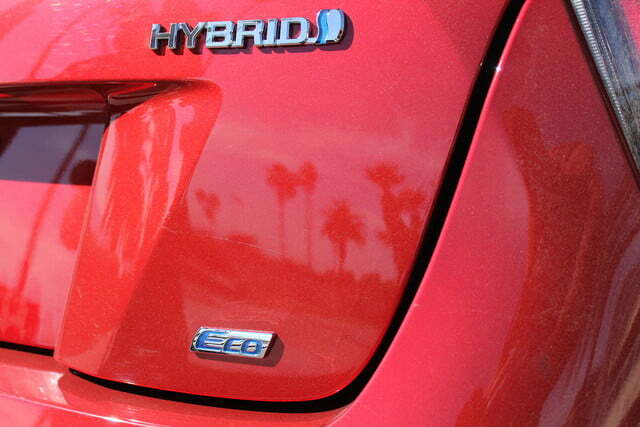 In actual fact, a more nebulous answer holds the key to the hybrid’s squinty, swoopy exterior. 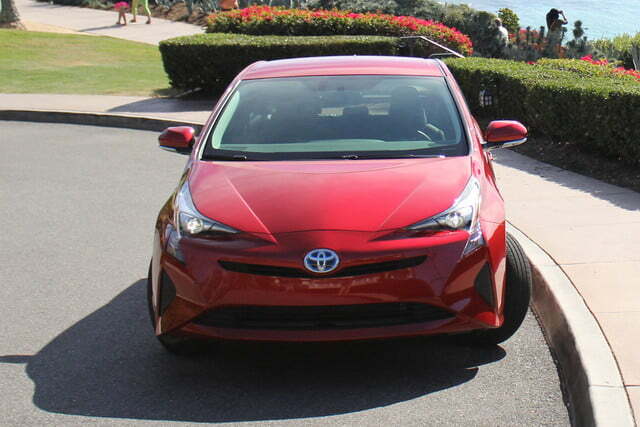 Toyota simply says they want the Prius to look “different.” While maintaining the current car’s triangular profile, the automaker styled the front and rear to clearly communicate uniqueness – ‘hybridness’ if you will. In person, the overall look reminds me of the first generation more than previous designs. 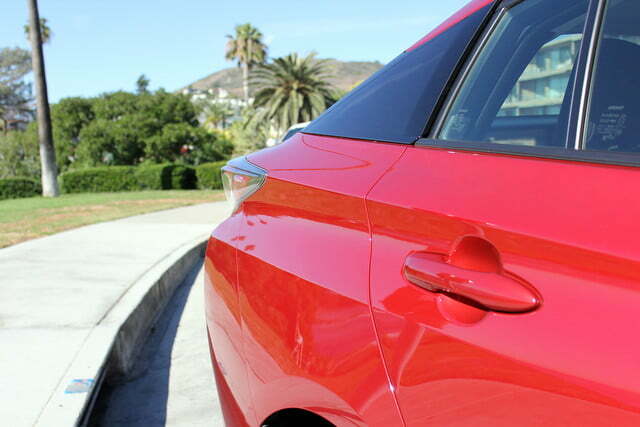 The pinched face and sedan-like profile differ from the hatchback styling of the previous two generations. While my first look online did not accompany favorable thoughts, the design risks are far less odd in the metal. 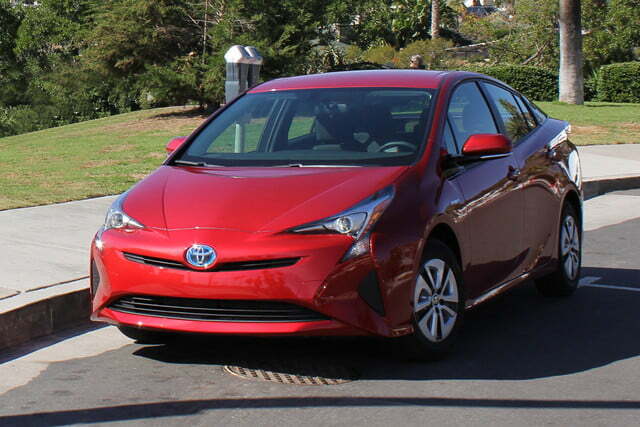 Frankly, I’m always willing to give an automaker some grace when they take a chance on distinctive styling, as opposed to insisting on conservative packaging, and the new Prius is no exception. 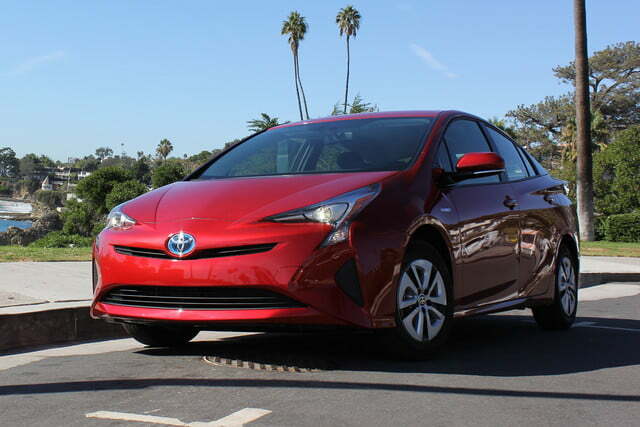 Whatever your opinion of its styling, the 2016 Prius is about far more than a compelling exterior. 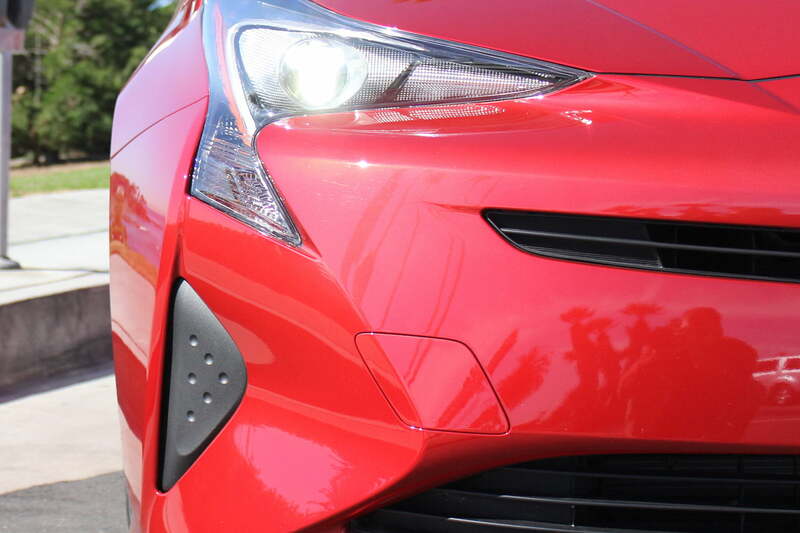 A look at the spec sheet for the 2016 Prius might have you scratching your head. Compared to the current (third) generation, the new model offers three more miles per gallon in the city (in standard guise), less combined horsepower and torque, and a curb weight that’s actually 33 pounds heavier than before…what gives? 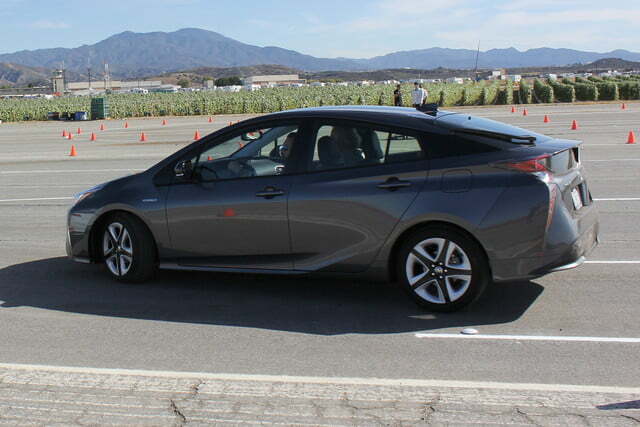 I’m not suggesting you’ll see a 3,000-pound hybrid at your next autocross event, but you might have a surprisingly fun test drive. 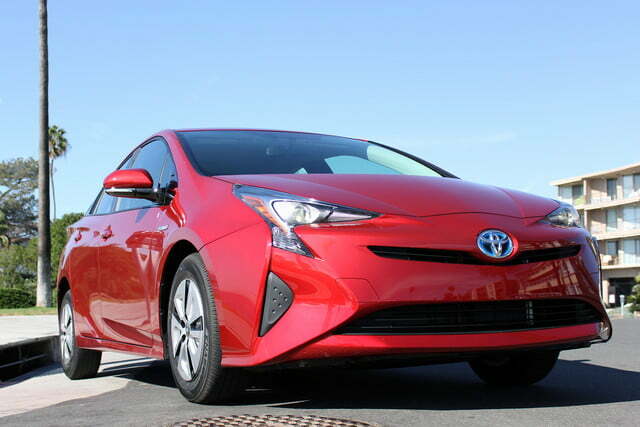 Despite some confusing data, the 2016 Prius boasts more advanced technology, vastly improved driving dynamics, and a significant interior upgrade. At its heart is a 1.8-liter Atkinson Cycle four-cylinder engine making 95 horsepower and 105 pound-feet of torque paired with an electric motor and lithium-ion battery pack (a first for the Prius) good for 71 hp and 120 lb-ft of torque. 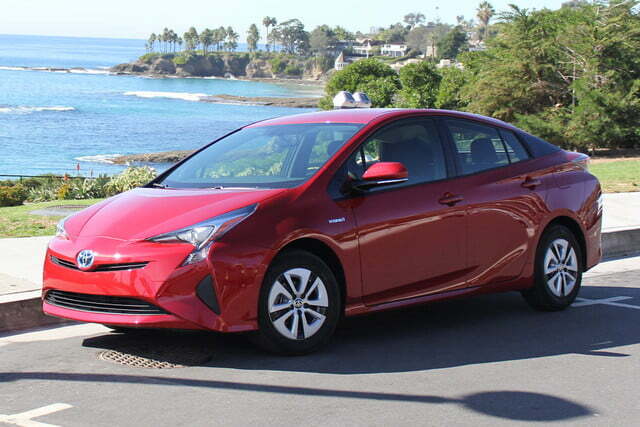 As with all hybrid setups, combined output is never as simple as adding the two figures, so the 2016 Prius only manages 121 horses, 13 fewer than the current model. 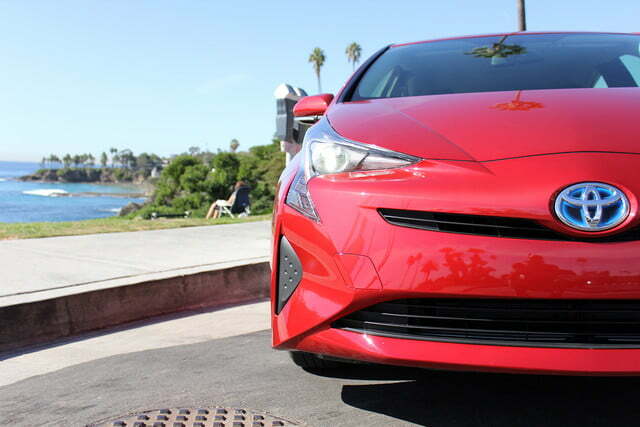 However, Toyota claims that it tuned the electric motor to offer more torque for low-speed acceleration, meaning the car’s 0 to 60 mph sprint will remain the same (approximately 10.0 seconds). 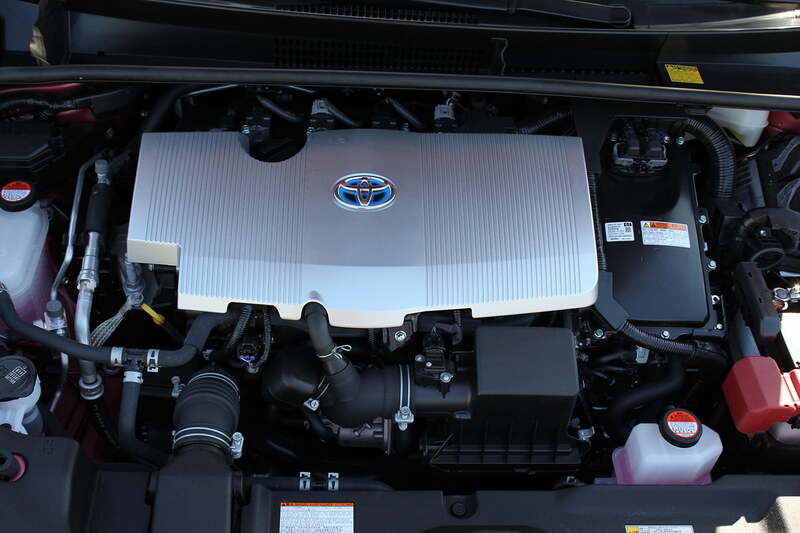 Thanks to a new intake system, cylinder head cover, EGR valve, exhaust system, and greater thermal efficiency (now 40-percent), Toyota has reduced the size and weight of its gas engine. 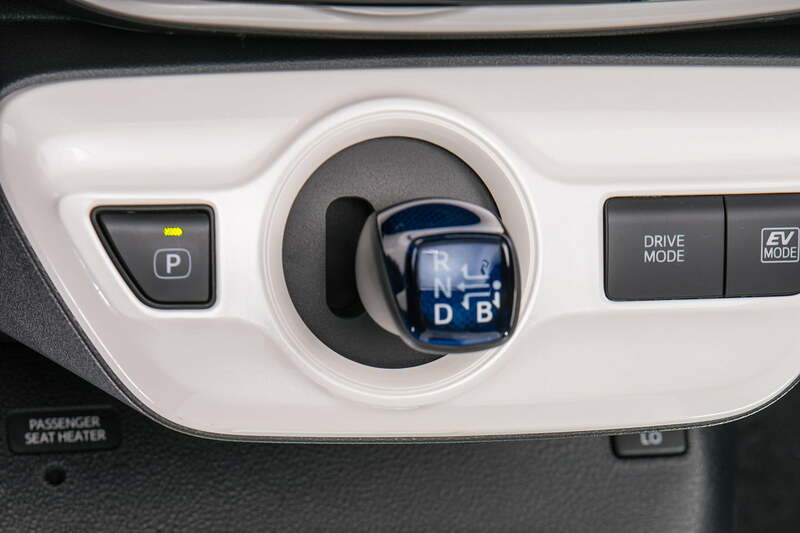 Other improvements include a new power control unit that cuts parasitic loss by 20-percent and a new electronic CVT (continuously variable transmission). Toyota also moved some hardware. 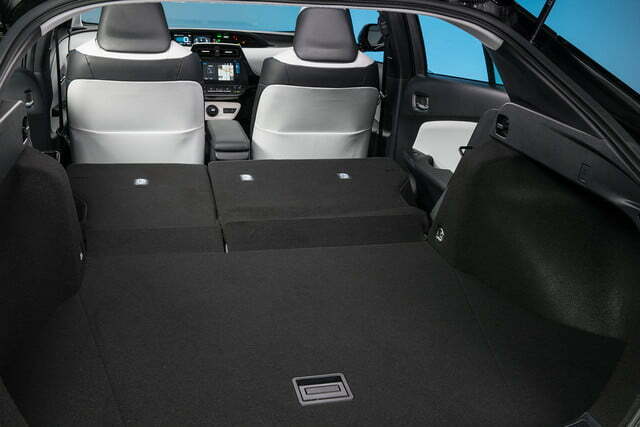 The battery is now underneath the rear seats (it was previously located in the trunk), which adds trunk space, and the electric motor is mounted on a parallel shaft, which reduces friction loss. 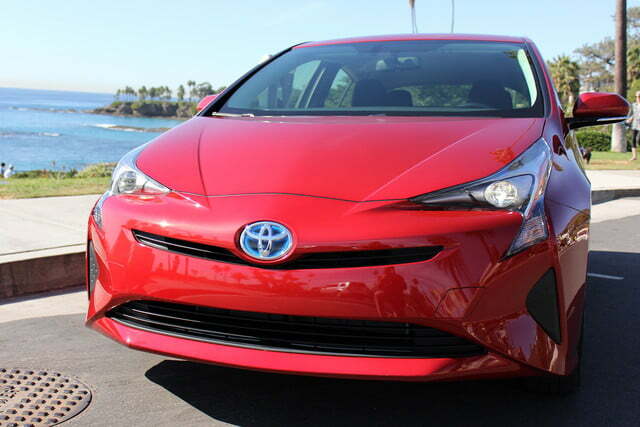 Toyota will continue to use its nickel-metal hydride battery pack on the entry-level Prius 2 and Prius 2 Eco versions, but all other trims will use a lithium-ion battery that’s lighter and stores more electricity by battery volume. Regardless of battery type, the Prius will deliver 54 mpg in the city, 50 mpg on the highway, and 52 mpg combined. 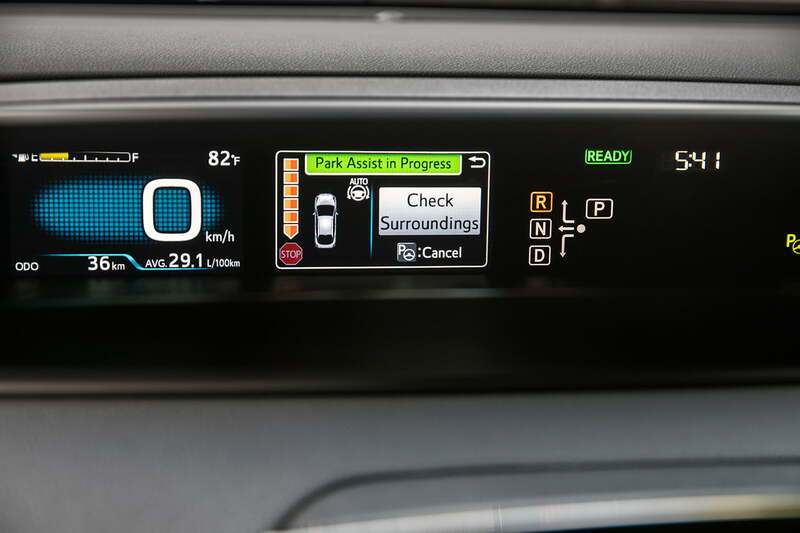 If you opt for the ‘Eco’ designation, those numbers will improve to 58 mpg city, 53 mpg highway, and 56 combined, but you’ll have to do without the spare tire and some electronic convenience features. 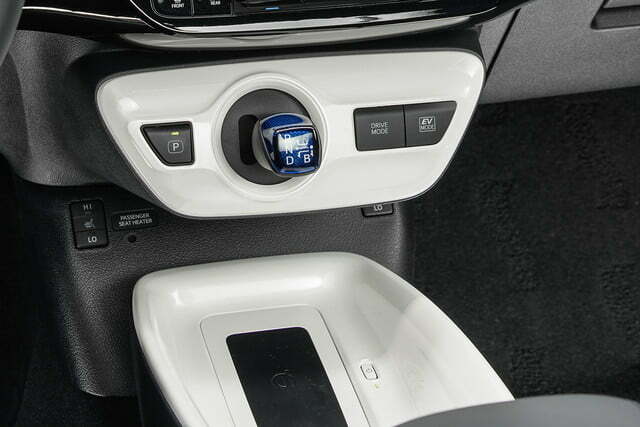 By comparison, the redesigned Chevrolet Volt manages 41 combined mpg and the Ford C-Max achieves 40 combined mpg. 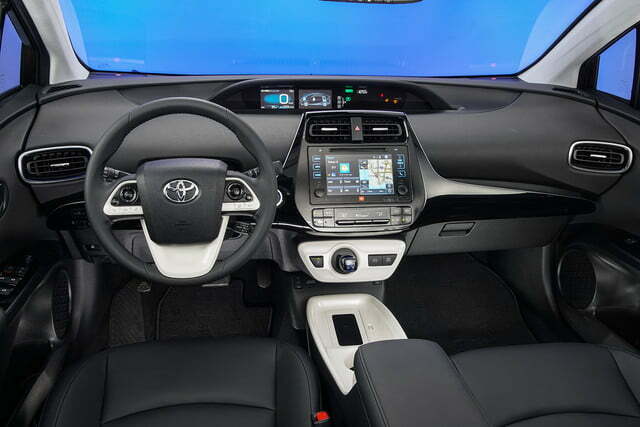 While the exterior may draw criticism, the fourth generation Prius offers two significant improvements just about everyone will appreciate: a handsome interior and a shockingly fun driving experience. It’s not a question of whether Toyota’s 2016 Prius will get on the podium; it’s a question of whether it still has the goods to earn gold. Using a design philosophy the automaker refers to as “ingenious beauty,” the new cabin is uncluttered, modern, and has a sense of airiness. The center stack has been totally overhauled, replacing the dividing centerpiece with a tiered dash. High-gloss finish is used on the main instrument panel and door inserts while higher-spec versions offer SofTex® (leather-esque) surfaces. 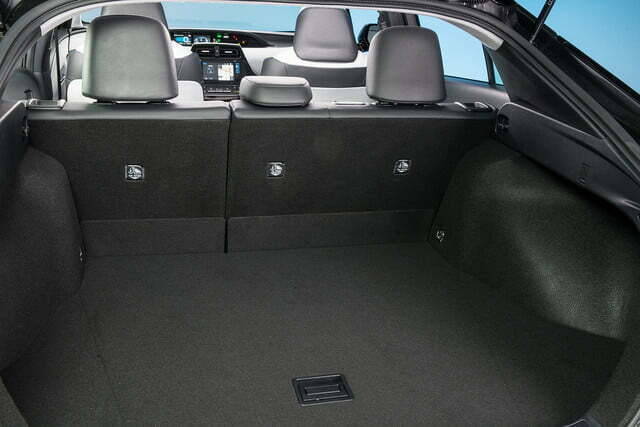 Regardless of variant, Toyota includes all new seats that sit lower and offer more support than the current ones. Also standard are three driving modes: Eco, which prioritizes fuel economy, Power, which prioritizes acceleration, and Normal, which balances the two. 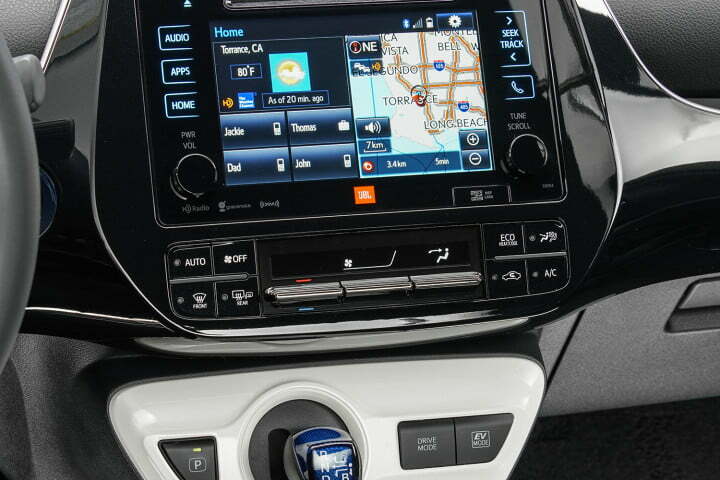 As for convenience features, Toyota continues to offer just enough in the way of contemporary tech. goodies to appease the masses without getting too innovative. 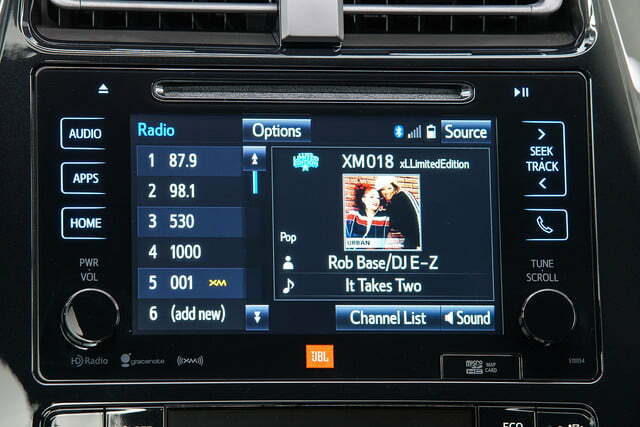 The center-mounted information displays are a pair of 4.2-inch full-color, high-resolution displays with readouts for drive modes, energy regeneration, vehicle speed, climate settings, audio information and more. 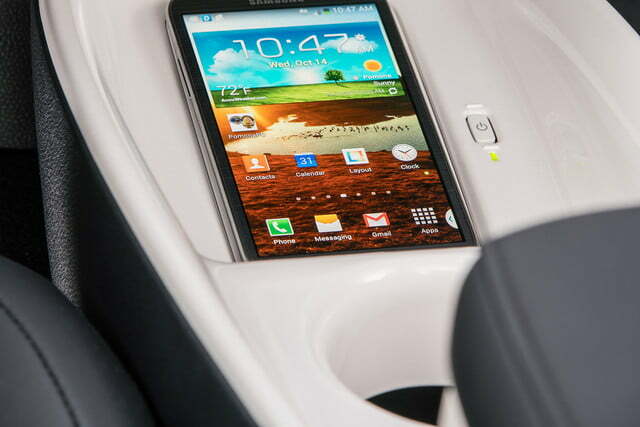 On the higher grades, you can add a 7.0-inch infotainment system with a 10-speaker JBL audio system, Siri Eyes Free®, wireless phone charging, and a “smart-flow” climate control system, but the tech. 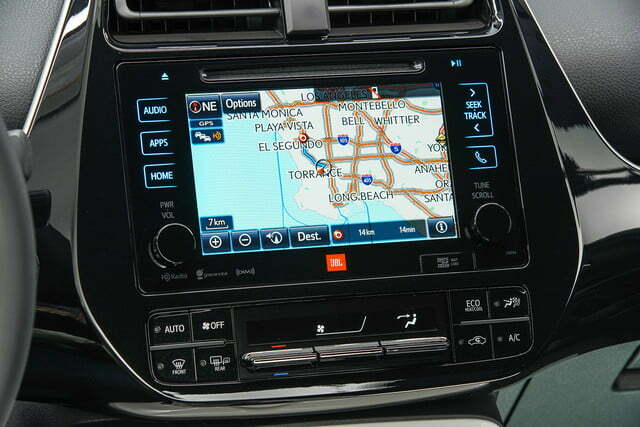 still feels lackluster compared to new systems from rivals like Honda. 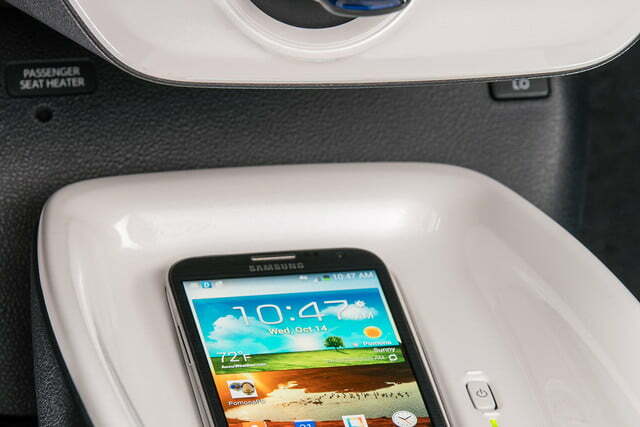 Noticeably, regardless of trim, there’s only one USB port – that’s a no-no at this stage in the game. 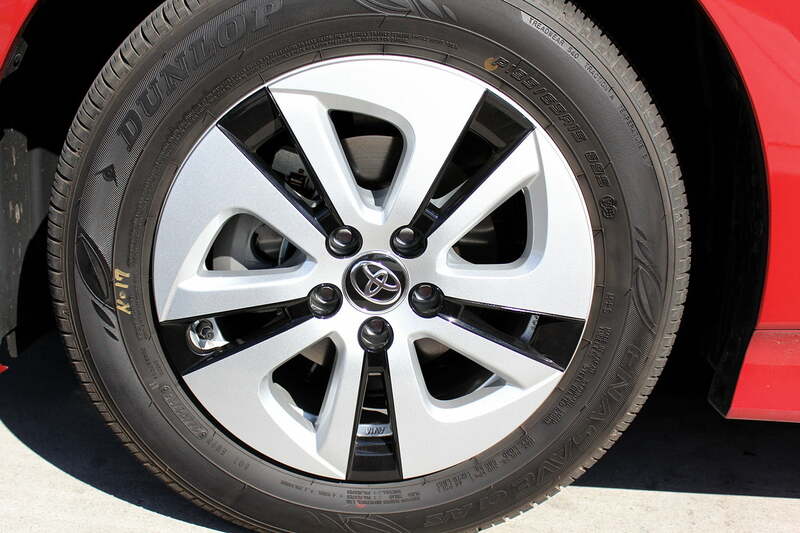 Where Toyota does step up a bit is with its new suite of safety systems, dubbed TSS-P. 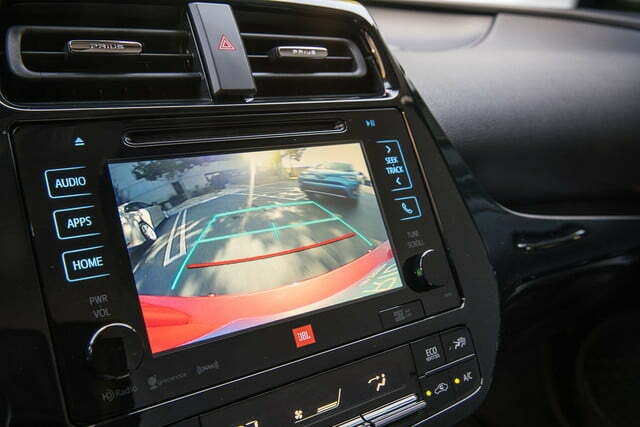 Included is a pre-collision system with pedestrian detection, lane departure alert with steering assist, automatic high beams, and full-speed radar cruise control. We were given a chance to test out these systems on a course and everything worked flawlessly. Though it’s not directly related to the safety equipment, Toyota also now offers a color head up display with speedometer, navigation, and hybrid system information. 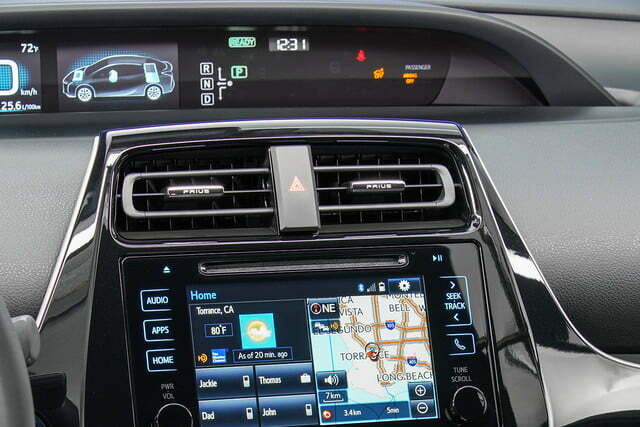 While none of these systems are revolutionary, in typical Toyota fashion, each feature is easy to use (especially now that all the major ones are accessible on the steering wheel) and suit the needs of most consumers. Now to something truly remarkable: thanks to a 60 percent more rigid chassis and a new independent rear suspension, the 2016 Prius is actually fun to drive. 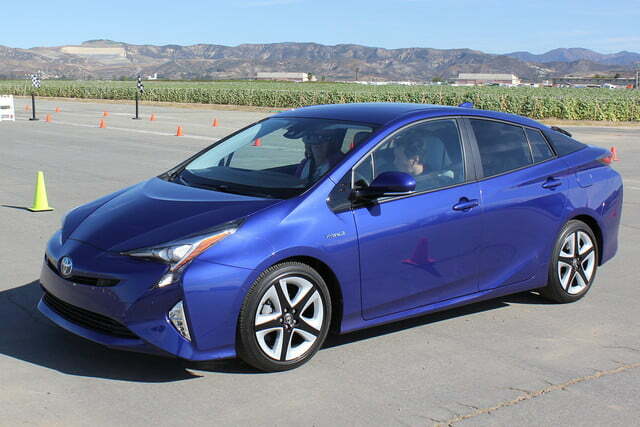 Before you mock, let me add a qualifier: the Prius is not a sports car (duh). Nothing about its exterior or its powertrain attempts to convince you otherwise. With that said, Toyota does know how to make fun-to-drive vehicles (i.e. the GT86/Scion FR-S), and it has obviously had some fun with this new platform. 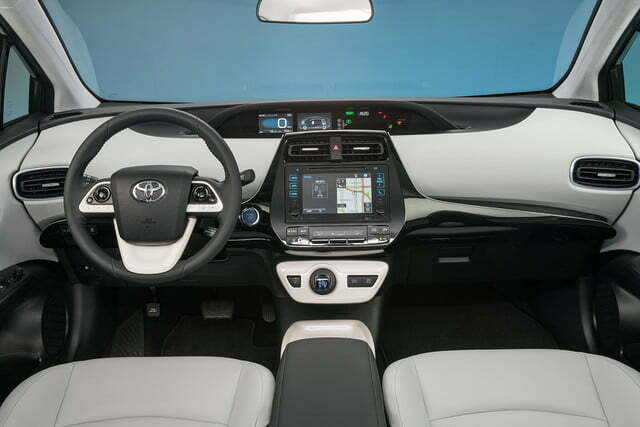 The chassis in question is the brand’s all-new TNGA (Toyota New Global Architecture) structure and the Prius is the first model to use the scalable platform. In addition to fresh underpinnings, the 2016 Prius swaps a torsion beam rear end for the MacPherson strut independent rear suspension. 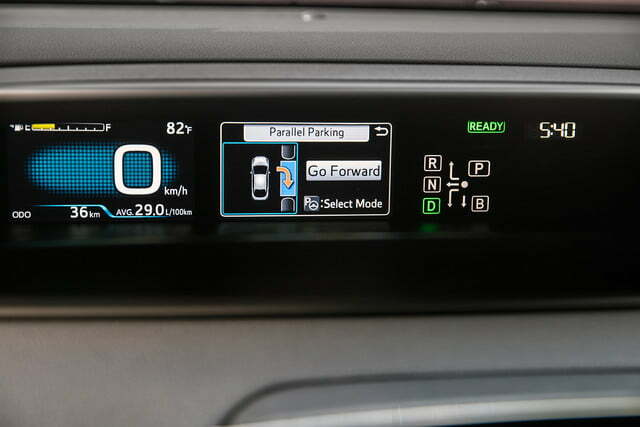 As a result, the fourth generation Prius not only rides better, but it also doesn’t hate to change direction nearly as much as its predecessor. 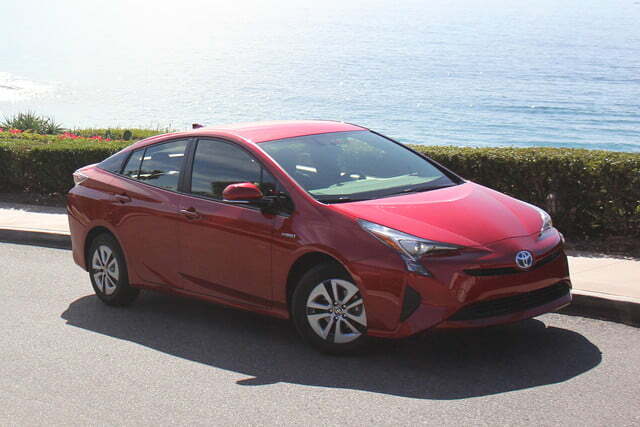 Combined with a 1-inch lower ride height, 0.6-inch wider stance, 2.4-inch longer body, lower center of gravity from its battery relocation, and retuned brakes, the new Prius mitigates body roll impressively and feels confident during aggressive maneuvers. 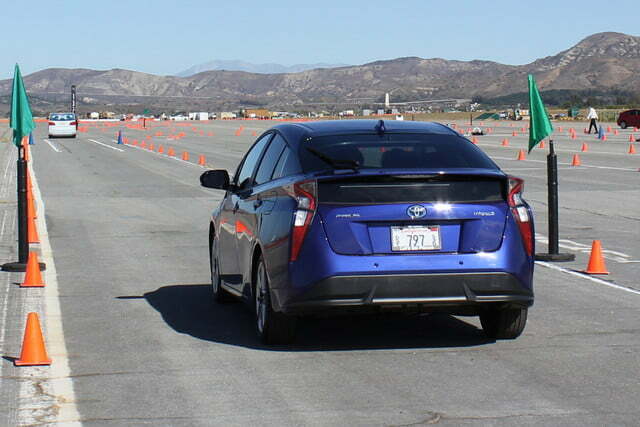 I’m not suggesting you’ll see a 3,000-pound hybrid at your next autocross event, but you will be pleasantly surprised by its driving dynamics during a test drive. While you cruise around in your contemporary electric car, why not let your kid enjoy a classically-styled toy that has its own electric heart? Keep your shiny new Prius, showroom quality with a good car care kit. Let your neighbors know you care about the environment AND looking good. Speaking of clean, put that electric power to other good uses, like maintaining a spotless smile! 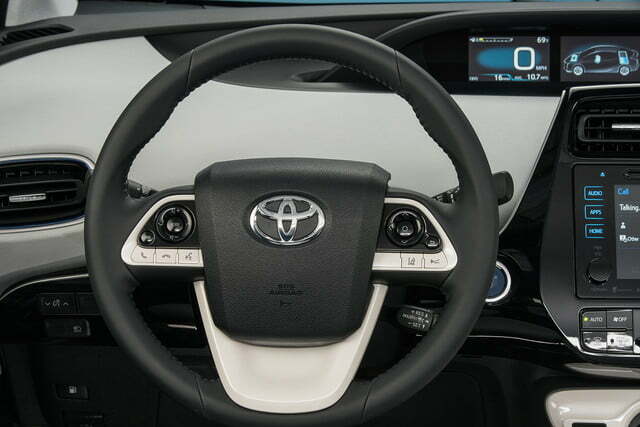 Risqué styling aside, the 2016 Prius offers interior, handling, and efficiency updates that will put further car lengths between the original hybrid and its competition. 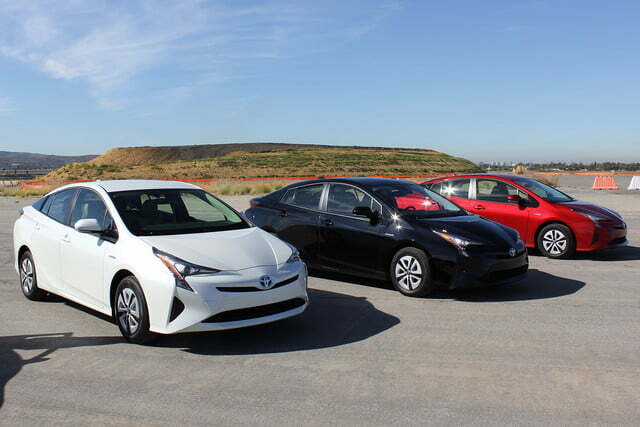 Until the consuming public truly embraces an all-electric vehicle lifestyle, the Prius will continue to be the easy choice for those who simply want fewer trips to their local gas stations. And when that greener day comes, the Mirai may well have developed its own cult following. 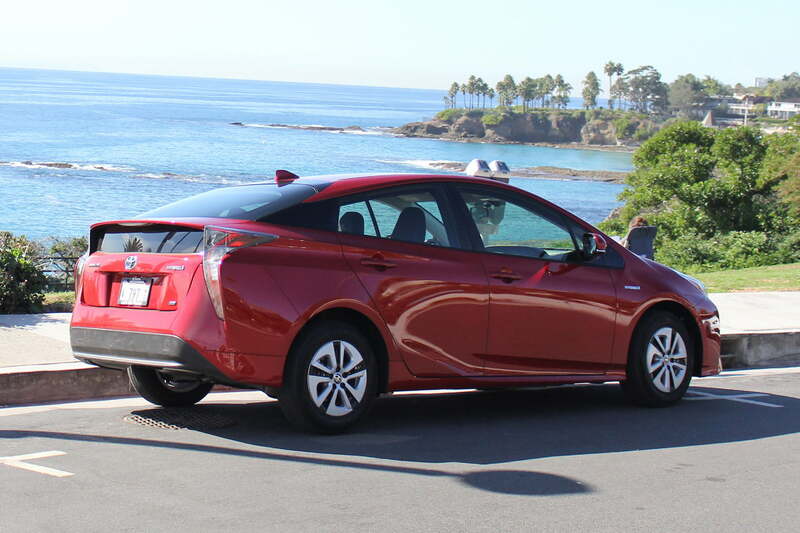 The 2016 Prius will hit dealers early next year carrying the same starting price as the present generation: $25,035 (including destination) for the Prius Two. 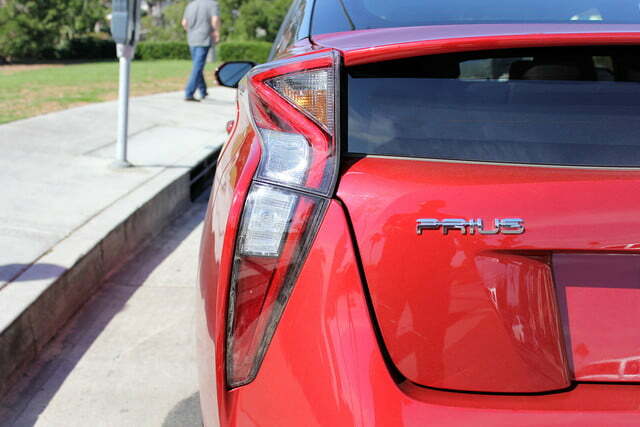 For $500 more, the Prius Eco cuts weight and adds fuel economy. On the opposite end of the spectrum, the range-topping Prius Four Touring carries a $30,835 price tag. Still on the way is a redesigned plug-in hybrid version, which should offer an all-electric range of 13 miles.